To prevent injury, improve exercise form and make your workouts more effective, it’s important that you warm up properly before exercising. Try this set of dynamic warm up exercises next time you want to prepare your muscles, tendons, and joints for additional strength training. 3. Modified jumping jacks: 60 seconds. Start with your feet together and your hands by your sides. Take a step to one side and bring your hands above your head. Return to the starting position and repeat on the opposite side. 4. Mountain climbers: 30 seconds. Start on your hands and knees, bring one knee up toward the center of your stomach and then quickly alternate between legs. 6. Stutter steps: 30 seconds + 30 seconds. Stand with your feet shoulder-width apart, face front, extend your left leg back and raise your arms above your head. As you crunch, bring your left knee up and bend your arms. Repeat for 30 seconds and then switch sides. 7. Side to side squats: 60 seconds. Squat and, as you stand up, take a small step to the side and squat again. Repeat this side to side movement until the set is complete. 8. 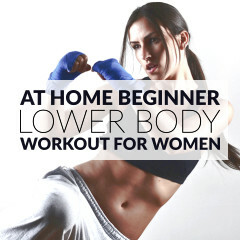 Reverse lunge front kick: 60 seconds. Take a step back with your right foot and lunge. As you come up, kick your right leg up. Repeat this movement with your left leg and keep alternating legs until the time is up. 9. Forward leg swings: 30 seconds + 30 seconds. Stand up straight and hold onto a wall. Swing one leg forward and backward in a single smooth movement. Switch legs. 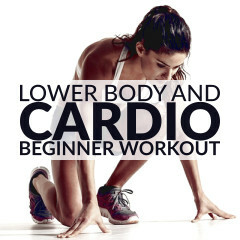 Continue with a lower body workout and finish with a series of lower body stretching exercises. 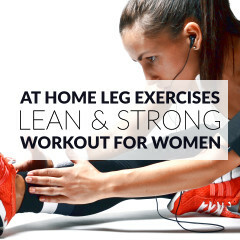 Prepare your muscles & joints for additional training with this lower body routine!